You won’t get Popeye’s muscles from eating your own spinach but you will probably taste the benefits. 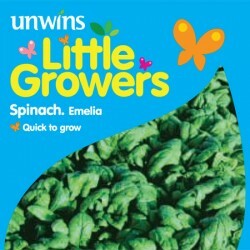 This spinach is really easy to grow and you can pick the baby leaves and add them to salads stir fries sauces and pizza. Or leave the plants to mature and pick for a really tasty steamed green vegetable. Tasty! Our community of gardeners have a wealth of experience, beautiful garden and great photos, discover more on the following pages: ideas for children.